The image of the black hole as captured by eight telescopes on Earth. Black holes are stranger than anything dreamt up in science.” The observations were made in 2017 using a technique called very-long-baseline interferometry which synchronises telescopes around the world and exploits Earth’s rotation to form one planet-sized telescope. “We are giving humanity its first view of a black hole, a one-way door out of our universe,” said Dr Shep Doeleman, Director of the Event Horizon Telescope (EHT) team which has been hunting for a black hole for a decade. 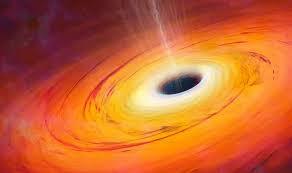 Until now black holes have only been seen indirectly through their impact on nearby galaxies and stars. It was thought they would be impossible to ever observe. But researchers, including astrophysicists at University College London (UCL), looked for the shadows cast by super-heated bits of space rock and dust as they tumbled into the black hole. The image, hailed as ‘huge breakthrough for humanity’ shows a glowing mass of plasma with a clear circular area of distorted spacetime in the centre. Dr Ziri Younsi of UCL’s Mullard Space Science Laboratory, who worked on EHT project, said: “We have accomplished something many thought impossible by imaging the shadow of a black hole and it provides the strongest evidence to date that such evasive and enigmatic entities do indeed exist. “You could never actually see a black hole but because it is so powerful you can see when matter starts to fall into it, getting closer and closer. “I was amazed to see the image. I got a sense of tremendous excitement. It’s something we have been working on for 10 years and actually the image was surprisingly unsurprising. Einstein’s theory of general relativity predicted an image like this. “But at the same time I thought, wow, what does this mean now? How will this help our understanding of the universe. We now need to start analysing the granular image and get into the nitty gritty. Scientists now believe supermassive black holes lurk at the heart of most galaxies. The new image is of a supermassive black hole at the centre of the distant galaxy, Messier 87, which is 55 million light-years away in the Virgo galaxy cluster. It measures just under 25 billion miles (40 billion kilometres) across, which is around three million times the diameter of the Earth and has a mass of 6.5 billion times that of the Sun. Although supermassive black holes are relatively tiny astronomical objects, it was predicted to be one of the largest viewable black holes from Earth, making it the perfect target for the EHT project. The eight telescopes located in volcanoes in Hawaii and Mexico, the mountains of Arizona, the Spanish Sierra Nevada, the Chilean Atacama Desert, and Antarctica act work together like a composite eye, gazing up at the stars. M87’s black hole is around 2.5 times smaller than the shadow it casts, but appears larger because it’s dramatic impact on spacetime and light. “The history of science will be divided into the time before the image and the time after the image,” he said. “Stephen Hawking once said, that it is sad that facts are sometimes stranger than fiction and nowhere is that more true than in the case of black holes. The breakthrough was announced today and the research published in a series of six papers published in a special issue of The Astrophysical Journal Letters.